Yandex.Mail is easy to use from their website, but not so great if you're on a mobile web browser. 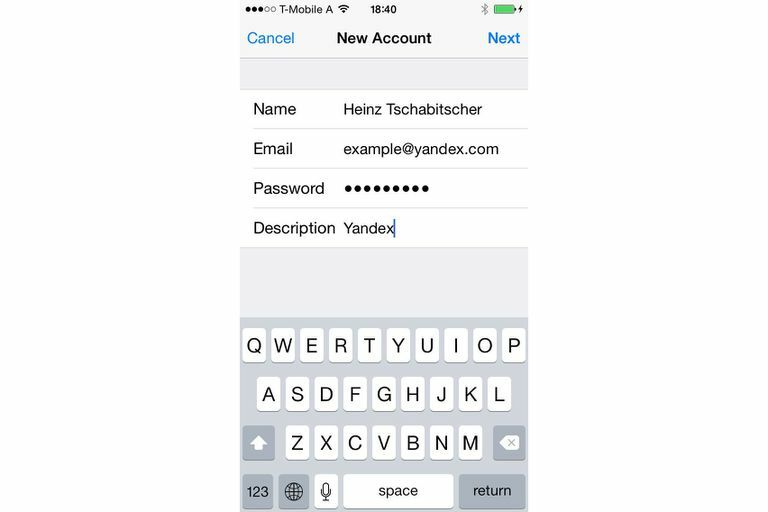 Fortunately, you can set up Yandex.Mail with IMAP access through the built-in Mail app on your iPhone or iPad. Once you have, you'll be able to use Yandex.Mail along with any other email accounts you've set up on your iOS device. Scroll down and open the Accounts & Passwords menu. Select Other from the bottom of the list. Pick the Add Mail Account option at the top. On the next screen, fill out all the text boxes, including your name, Yandex.Mail email address, the password to your email account, and an optional description to identify this account from any others you set up. Tap Next to move on to the next screen. In the IMAP tab, enter the IMAP server settings for Yandex.Mail in the INCOMING MAIL SERVER section. These settings are necessary in order to download mail from your Yandex.Mail account. Below that section, under OUTGOING MAIL SERVER, type the Yandex.Mail SMTP server settings so that the Mail app understands how to send mail to your email account. Make sure Mail is enabled on the next screen, and then tap Save to finish setting up your Yandex.Mail account. How Can You Quickly Archive or Delete Messages in iOS Mail? How Do You Prevent iOS Mail From Downloading Remote Images?